Every year in Chioggia, the second Friday of the month of July, there is the Fish Festival. This popular event has been defined one of the 100 wonders of Italy. 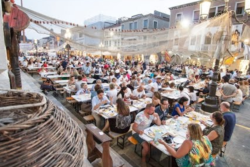 For ten days the old town of Chioggia becomes a big outdoor restaurant, full of flavours, music and shows. In 1938 the first Fish Festival took place in order to promote tourism, the fishing folklore of Chioggia and the town first resource: fish. Every edition fosters the culture and the culinary tradition of Chioggia, with all its typical products, such as fish, vegetables and bread. The outdoor restaurants are characterized by wooden structures, which recall the lagoon and the seafaring traditions of Chioggia.